Who is Phillip R. Johnson? 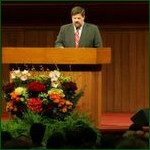 Phillip R. Johnson is perhaps best-known for the blog he founded, and a few other notable websites. Today, he is the Executive Director and radio host for Grace to You, a Christian media ministry featuring the preaching and writings of John MacArthur. Phil has been closely associated with John MacArthur since 1981 and edits most of MacArthur's major books. Phil also pastors an adult fellowship group called GraceLife at Grace Community Church in Sun Valley, CA. And he can be heard almost weekly on a podcast with Todd Friel titled "Too Wretched for Radio." Phil studied at Southeastern Oklahoma State University for one year, then transferred to Moody Bible Institute, where he earned a bachelor's degree in theology (class of 1975). He was an assistant pastor in St. Petersburg, Florida and an editor for Moody Press before moving to Southern California to take his current position in 1983. Theologically, Phil is a committed Calvinistwith a decidedly Baptistic bent. (That explains his love for Charles Spurgeon). Phil is also an inveterate reader and bibliophile. He has a beautiful wife (Darlene), three grown sons, three fantastic daughters-in-law, and seven adorable grandchildren. For an abbreviated bio and hi-res photo of Phil, click here. A PS from Phil: The Darwin on Trial Phillip Johnsonthe more distinguished Phillip Johnsonteaches at Berkeley. I used to put his e-mail address here for those who were looking for him, but people kept sending him mail meant for me, which only compounded the name-confusion problem. So if you want his e-mail address, you may get it from his home page at The Access Research Network.